There is no doubt that Nigerians love sports and it is no longer just about entertainment; it is also about making (and losing) money. A whole lot of money. The billion dollar sports betting industry is obviously growing astronomically as the football culture especially continuously to bloom. It is starting to become a phenomenon across Nigeria, apparently because there is good money to be made and everyone wants to be a part of it. The first betting events ever to be recorded in history were held in the time of the Greek city states, over 2,000 years ago. The Romans soon adopted it from the Greeks and they turned it into a real business, especially from the famous gladiator games. It soon spread to England, where its most famous branch was horse racing, and subsequently, to the rest of the world. Over the years, many betting companies have emerged in Nigeria. We have Nairabet, Merrybet, Bet9ja, Naijabet, Lovingbet, Surebet247, Supabets, 1960bet, Nairastake, Parknbet, 360bet, Sportybet, Plusbet, Skybetnaija, 9jadollarbet, Visabet, Winnersgoldenbet, and many more. Betting outlets can now be spotted on almost every street in Nigeria’s major cities, with new ones springing up daily. According to a report by News Agency of Nigeria (NAN), roughly 60 million Nigerians between the ages of 18 and 40 are involved in active sports betting. Almost N2 billion is spent on sports betting daily in Nigeria, which translates to nearly N730 billion in a year. As one of the world’s fastest growing markets for mobile phones, the widespread use of mobile phones in Nigeria has been a positive game changer for the sports betting business. Every day, it gets easier to pay, play and win or lose. There are about 169 million cell phone subscribers and 100 million internet users in Nigeria, with 80 percent of this figure being able to access the internet on their phones. In a country where the majority live below the poverty line, supporters of sports betting in Nigeria claim it’s a business that offers employment to thousands of young people, provides quick money for ordinary people, generates tax revenue for government and contributes to economic growth. 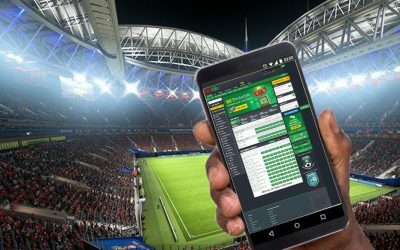 What are the benefits of sports betting? The potential economic benefits of legal sports betting are quite juicy. It can increase state revenue in form of taxes and other levies paid to the government. Taxes from sports betting in Lagos State, for example, rose 30 percent to 40 percent in 2017 from 2016. It will also generate more job opportunities in existing casinos (oddsmakers, analysts, security, cashiers, etc.). There are also induced impacts on the economy which arise as employees spend their wages in the broader economy. For example, sports betting employees spend money on rent, transportation, food and beverage, and entertainment. Innovation is a key to success in this business as bet companies have looked out for more opportunities. The outcome of one of these was when Bet9ja first introduced a state-of-the-art virtual dog race into the market and it became an instant success. The idea of instant outcome. Job opportunities in lottery and sports betting are limitless and the revenue can help sustain the economy of the country. Croatia in 2015 funded 19 percent of its budget with revenue accrued from lotteries. Another example is the 2012 London Olympics Games which was said to be solely financed by revenue from lotteries. The industry has also seen significant growth in the number of payment solutions that are available. All that is definitely changing the gaming space. According to a 2016 data from the Nigeria Inter-Bank Settlement System (NIBSS), which is owned by the Central Bank and licensed banks, there were 14 million web payments worth a total of N132 billion ($420 million). Transactions leapt to 29 million worth N185 billion in 2017 and in the first quarter of 2018, there were nearly 10 million worth N61 billion. A leading report on gambling in Africa, published in 2016 by KPMG, reeled out some startling numbers from the sports betting industry in Nigeria. As at 2016, the leading sports betting company, Bet9ja raked in an average monthly turnover of $10m, while NairaBet made an average turnover of $3m-$5m, a 20-30% margin on profit. Without question, gambling comes with great risks and with some of these risks come losses including some that could be too much to take. Gamblers should always bear in mind that betting relies on uncertainties and one must be able to handle whatever comes with making such decisions. I mean, how do you put your money on the possibility of a yellow card in a game, something mostly based on the state of mind of the referee and mostly always controversial? While this growth in government and personal revenue is a welcome development, there is still considerable concern about the potential for the gambling sector to cause harm in form of addictions, loss of savings, idleness and increased crime. Hence, as the gambling industry continues to grow in popularity and prevalence, a well-founded understanding of its operations and socio economic implications is imperative. More importantly, the government can do a lot better if it wants to key in to this sector as an alternative revenue stream. The industry is totally ICT driven; a report says that Nigeria loses over $5 billion to foreign companies on software per annum. So you can imagine the revenue and employment opportunities that the government can tap into if Nigerian software developers were encouraged. In the nearest future, I believe that we are going to see many state governments start to run their lotteries as alternative revenue streams. This article was written for Nairametrics by Raheem Roqeeb.